Hello everyone and thank you for having me on Busy Being Jennifer! I’m Allison and I write at Frugal on the Prairie. I’m a wife, mom, and penny pincher. I make every single dollar work hard for my family and I keep my home as organized and efficient as possible. Spring is here and with that comes all of the cleaning projects you and I have been avoiding for the past year. If you stay organized and have a schedule, I can promise you’ll feel less stressed out. Remember, Spring Cleaning isn’t about doing regular housework. It’s about cleaning those extra nooks, crannies, and special areas in your home. Don’t focus on regular chores because you’ll be doing them every week anyway. See? This is getting easier already! Start in the bedrooms of your home. Why is this important? Because you’ll wake up on Tuesday and the first thing you’ll see are the results of your hard work from Monday. This will give you the surge of energy you need to keep going! Once the bedrooms are sparkly clean you’ll want to tackle what I call my home’s “social weak spot.” This is the area I’m most worried about when I have guests drop by unannounced. (And trust me, they usually drop by unannounced when I’m looking my craziest…) The rest of the house may be an untouched disaster but your friends will never know and I certainly won’t tell on you. Move on to your neglected office/craft/spare room because you don’t want to leave the heaviest mess for last. I once designated our spare room as my craft room. I really should have called it the Junk Drawer Room because it was that terrible. Think of your accomplishments so far and channel your energy towards weeding through that pile of yarn from 2003. Work on the kitchen next because that spaghetti splatter has been there since pasta night from last March. This is my least favorite room in the house but one of the most necessary to clean. Don’t give up now, you’re almost done! It’s your last day! Let’s tackle all those odd projects around the house that could use some freshening up. You did it! You made it through an entire week of Spring Cleaning and you survived. Now sit back and enjoy a glass of wine, because that’s definitely what I’ll be doing on Sunday. I hope you found the guide to be helpful. I would love your feedback in any form! 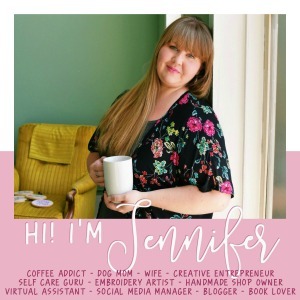 Thank you for having me guest post, Jennifer! Getting your Spring Cleaning Done? We’ve got a Guide to help you get it done in 6 Days! This is a great guide! I’ve really been trying to get a little more efficient with housework, it doesn’t come natural to me. I like the idea of focusing on one room at a time so it’s not completely overwhelming. Thanks for your feedback, Carissa! I agree, one room at a time is the way to go. I would never finish my house if I didn’t do it that way. Thanks for linking up and sharing these great organizing tips on the #ShareTheWealthSunday blog hop. I hope you will join us again next week! What a great guide and printable! Thank you for sharing it at the #SmallVictoriesSundayLinkup! This was so helpful to me! I’ve been meaning to finally get started on spring cleaning, and having a guide like this just makes it so much easier.